A big congratulations to the cast, crew, and volunteers of the Wizard of Oz musical production that wrapped up last weekend. Thank you for being involved and to all those who came to support the show. Thank you all for being a part of our 47th consecutive musical tradition! This weekend is the annual Peacock Polar Bear. 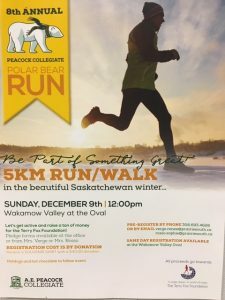 On Sunday, December 9 at 12:00pm at the speed skating oval in the beautiful Wakamow Valley come join in a 5K run/walk with all proceeds going to the Terry Fox Foundation. November 27 Update – The Wizard of Oz This Week! November 20 Update – Congratulations Award Winners! October 29 Update – Good luck junior volleyball! Good luck to all three junior volleyball teams this week as your season finishes up! Also, a reminder to student and families there are no classes for students on Friday, November 2.